What is a sport kilt, is it different from a traditional kilt, and if so who would want to wear one? These are a few of the questions this page will address, so that you can decide if wearing such a kilt is right for you. First of all, how do you define a sport kilt? And how is it different from a Scottish kilt? Well first and foremost it is a casual kilt, made from man made material, usually polyester viscose. This means that it is machine washable, which is not something I recommend you do with a real woolen kilt. This type of kilt is becoming very popular, especially amongst Highland Games athletes in North America. One reason for its popularity, is the weight of the kilt. Understandably if you are competing at a Highland Games, you want a kilt that is considerably lighter than even a lightweight woolen kilt. And of course you don't have to have any concerns about getting it dirty, as you are tossing a caber, or throwing a hammer, you simply throw it in the washing machine when you get it home. Unlike traditional kilts, these type of kilts don't fasten with straps and buckles, instead they are usually held closed by velcro fastenings. This is yet another feature that athletes find advantageous, no straps and buckles to get snagged while they're competing. Some manufacturers even include a little elastic in the waistband, for extra ease of movement. They are fashioned to look as much like an authentic kilt as possible, but at approximately one tenth of the price. This again is a major advantage to the Highland Games athletes, because kilts can sustain damage during competition, so you don't want it to be so expensive that you are afraid to damage it. So are these kilts used by people other than athletes? Well yes, there is a growing market for inexpensive casual kilts, which many people these days wear for a night out in the pub, or to a football or rugby match, and many other leisure activities. A good example of this can be seen in the photo below. And I can understand the reasons behind this trend, after all you wouldn't want to risk damaging your expensive traditional woolen kilt, when attending for example a stag party. Whereas an inexpensive casual kilt which, if you don't look to closely can almost look like the real thing, can be worn without worrying to much about it being damaged. You can also of course wear the normal kilt accessories with your sport kilt, sporran, kilt pin, Sgian Dubh. These kilts are available in a fairly large number of tartans and can be a worthwhile addition to your kilt collection. 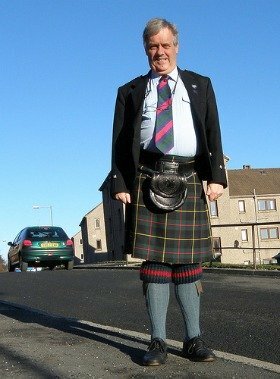 If you would like any further information on such kilts, or would like to know where you can best find one, then drop me a line using the Contact Us page, and I will be happy to help.